Lolli Redini has come to be regarded as a local dining institution and attracts a following of city weekenders & locals alike. 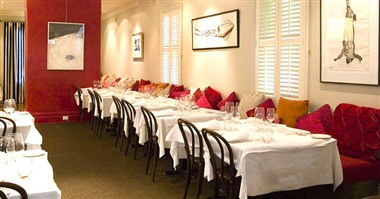 Lollis has been duly recognised by winning nine SMH Chef Hats since opening & a succession of Restaurant & Caterers Assoc. awards as well as being featured in numerous lifestyle & cooking magazines. The restaurant, a collaborative family project, was established in 2001. Named after friend Grazia LolliRedini, from the Tuscan village of San Gimignano, the Restaurant serves contemporary Italian & French influenced food using mostly local produce & other specially sourced items that conform to our highly selective criteria. Opening hours DINNER Monday-Saturday from 6pm LUNCH Saturday from 12pm.